Today post will be devoted to (how so!) another training which I had the opportunity to participate in. Since I had once decided to use others’ knowledge, I’m going to continue doing it. The more that if you have a good look around and get oriented, you’ll see there are many chances to do it. There has already been a little about Google Analytics, User Experience and Link Building. And the latter I am going to mention again. Strategies for the whole link building in SEO and acquiring appropriate spots are the matters which can be discussed for many, many hours. The biggest problem is probably that no one is going to give you a ready template which will solve all your problems straight away and will always be effective at the same time. Creativity and ability to figure things out allow us to get the entire subject in some way. 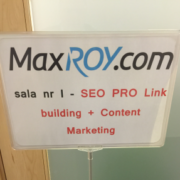 I’ve been to several workshops, trainings and conferences about link building. I took a few tips from each of them, as well as ideas and advice which I use and my business somehow runs. This time I took the direction of the Czech Republic – Brno and Julie Joyce of linkfish.com workshop taking place just before the Marketing Festival. 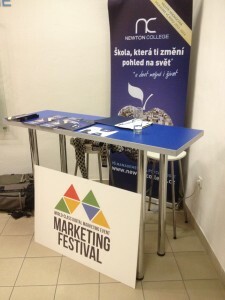 I will not beat about the Marketing Festival itself. Let’s just mention that it took place in Brno in the Czech Republic in the first days of November (1-2/11/2014). It tempted with its speakers, especially people such as Avinash Kaushik or Peter Meyers. Both gentlemen are from the US but it is much closer to go to the Czech Republic – which is a point for us in Poland since we are closer to Brno than to the US, then it would be a shame not to take advantage of this opportunity. What have I chosen? 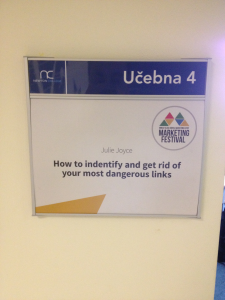 The morning workshop on link building, or “How to indentify and get rid of your most dangerous links“. So in general, the analysis of different kinds of links with a focus on the most problematic and potentially dangerous ones. What to do with them, how to avoid and recognize them. Should you check manually or trust special tools? A lot of questions and problems, and the whole workshop was intended only for four hours which doesn’t seem enough. Julie Joyce and Jay Young of Link Fish Media (for those who always ask what the natural link is … this is it) who led the workshop, did their job. I can say with clear conscience that during these four hours they squeezed maximum of necessary content. Exactly what I like – only the specifics without unnecessary chat 😉 In addition to replies to the questions in course description, they showed ways of finding right spots for thematic links for client domains and niche sites, which are very helpful in this topic. The cost of acquiring a valuable link in the US may be even bigger than 300-400 $. 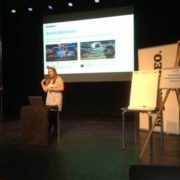 A number of good practices regarding link building process, outreach and cooperation with bloggers were presented. An average time to gain a link through outreach is 4-5h. Every industry in outreach is different and there is a way for each of them. You will not find any universal solutions to gain links for your industry. You should never reveal the client’s domain at first contact when doing link building through outreach. Tools such as LinkRisk and Link Research Tools are brilliant and accelerate work of the link profile research greatly, especially on large projects. At the same time they do not relieve a seo from manual review and link evaluation. They showed examples of “toxic links” from very popular sites for brand anchor. Finding spots for links through profiles of competition is no longer such a good option, mainly due to changes in Google approach and link profile perception. There is no such thing as a fixed link domain template for domains in the top 10 – the link profile must be in its own way unique for each domain. In the US domain Page Rank is still one of the most significant price factors when buying links for clients. There is no difference whether you are doing outreach from Gmail or a company domain account. Spam filters in your e-mail treat them the same. A key element in e-mailing outreach is personalized content and subject of the message. Finding links should be determined through relativity, traffic and the conversion potential for customer service. I want everyone to draw conclusions from this information by themselves. I have presented what interested me the most and what I found valuable. Sure, I won’t replace the workshop for you and won’t pass all the content but it’s better than nothing. The ones interested in the subject I refer to the site of guys from Max Roy (http://searchmarketingweek.com/szkolenie-seo- pozycjonowanie- pro/) who are serving us something really cool in November. Link Building discussed by Jon Cooper. It just so happens that we don’t have to drive 600 km to foreign countries to get the best knowledge from particular individuals. Not having to pay for hotels and transportation is just one of the many benefits. Unless someone is from Warsaw, they can sleep at e.g. Paweł Gontarek’s ;-), but the price is not comparable with foreign trainings and costs of participation in them. I assure you of that and you must take my word Jon Cooper will lead trainings on interaction between Link Building and Content Marketing. There will also be something for people involved in eCommerce industry. It sounds good and I think you need to take advantage of the fact that a guy from Florida comes especially for us to Poland. 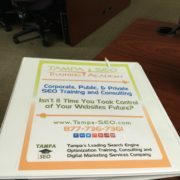 I will Cooper is a great SEO and Link Building specialist. He has been doing it for a few years and has been doing it pretty well. He has been a speaker on many industry conferences worldwide and a consultant in link building, he also works actively on his blog and is the author of a Link Builder’s guide. For a 21-year- old he has a lot of experience and knowledge, which he will share in Warsaw on November 21.